When you are working with a huge code base, you may discover bugs in your code (or worse, in someone else’s code) that prevent you from proceeding any further in your development. You can checkout to an old commit to see if the bug was present there — but this is often the worst way of doing so. Imagine you have a hundred commits to check — how much time would be wasted? Notice the “Unwanted line” that is supposedly causing the error. Once you have discovered a bug, you may or may not know the location of the faulty code. Let’s say that you do. In our case, let’s say that you know my_file is causing the trouble. In that case, we can run the following command to get more information about the lines in the files, and the commits those lines belong to. There you go — we now know which commit caused the error and what else was changed in that commit. We can proceed to fixing the error. 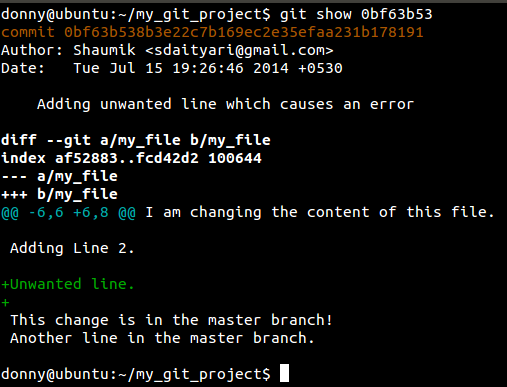 git blame helps you when you have some idea about what is causing the problem. What if you had no idea what is causing the error and there are hundreds of commits before you can go back to a working state? This is where git bisect comes into play. I will mention it once again — git bisect for a trivial situation like our case is overkill. However, I am going through the process for demonstration purposes only. Imagine git bisect as a wizard that takes you through your commits to find out which commit brought in the error. It performs a binary search to look through the commits, before arriving at the one that introduced the bug. To start off, we need to select a “good” commit, where the bug is not present. We then need to select a “bad” commit where the bug was present (ideally the latest commit that contains the bug, so you can assign it as “bad”). Git then walks you through recent commits and asks you whether they are “good” or “bad”, until it finds the culprit. It’s essentially a binary search algorithm over the array of commits to find which commit was the first “bad” commit. A very important thing to note here is that you should be searching for a single bug in this process. If you have multiple bugs, you need to perform a binary search for each of the bugs. Working with the same bug in the case of git blame, we will assume that we don’t know what file has the error. To check if an error is present in a certain commit, we will run cat my_file to see if the contents of the file contain the unwanted line. After we start the wizard, we need to inform Git about the commit where everything was working. Let’s examine the commit history to find the commit we want. Once we have assigned our good and bad commits (which serve as the initial and final pointers for our search) Git walks us through the commits and asks us whether each commit contains the bug. Notice in the screen shot that 7 revisions would be covered in roughly 3 steps. The number of steps grows logarithmically. Since 22 < 7 < 23, we need three steps. If there were a hundred revisions, we would need roughly 7 steps and if there were a thousand revisions, we would need about 10 steps. Since the line is not present, we designate it as a good commit. You may want to have a look at this nice screencast on Git Bisect, which takes you through the process that I have discussed. We have gone through the process of debugging in Git interactively. If you are familiar with unit testing, you could write a unit test that identifies the bug. In case you want to run the tests automatically, you need to provide Git the test script that you have written. Replace location_to_script_file with the actual location of the script file, removing the square brackets. Here’s a tutorial on how to mechanize the process of debugging in Git in PHP. We took an overly simplified case to explain a very powerful concept. 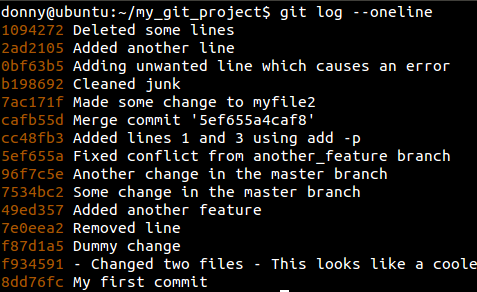 If you know what file has the bad code, you should proceed with git blame without a second thought. 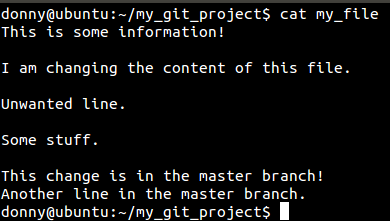 However, if you have no idea what is causing the error, and your repository is considerably large, with an enormous history, git bisect is definitely the way to go. How do you debug your code? Do you like binary search in Git? Do you have a better way of doing the same thing? Let us know in the comments below.